What you probably didn’t know about Cristi was that she was in the Fire academy all that time and just recently got accepted to a local city Fire Department! Woo hoo! And during the hurricanes that hit Florida and Texas, she was called by FEMA to lend a helping hand to neighbors in need. KnitCrate is really blessed to have her on board and our city is lucky to have her serving as a fire fighter! 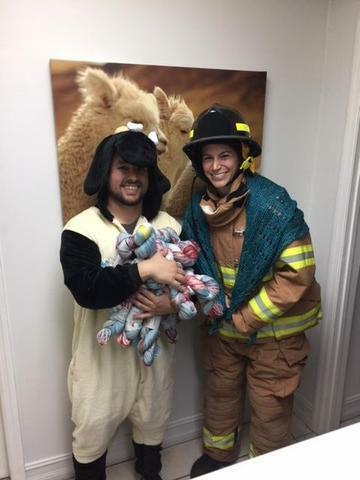 Here we are at the office… Cristi is here in her bunk gear and I’m wearing… Sheep pajamas? (I don’t know why I’m wearing that lol)… but that’s not the point. Cristi, you rock and thank you for everything you do here!